Every society has its own acceptable norms. What #BLOTUS is doing to the norms of this country is frightening, Personally, I think he is the leading factor in changing what is considered acceptable behavior in our society. His behavior and his actions are not reflective of who we are as a nation. He isn’t a leader we want our children to emulate. 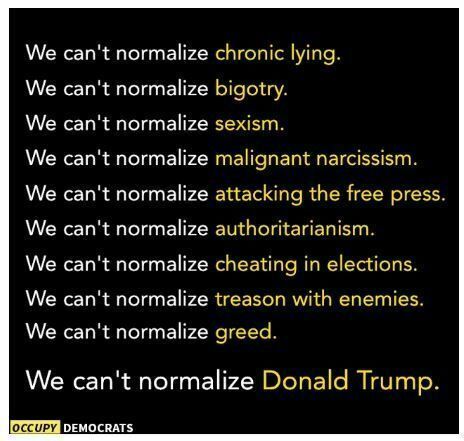 We cannot allow him to normalize behavior that should never be accepted in a free and democratic society. This entry was posted in News & Views, Quotes and tagged anger, authoritarianism, behavior, bigotry, BLOTUS, cheating, chronic lying, democratic society, ego, free press, greed, hubris, nation, normal, racism, sexism, treason, unacceptable norms, wealth, wrong on November 1, 2017 by Ray Buchanan.